AMLT token by Coinfirm is now available at BitBay.net! Shortly after announcing the cooperation between both companies, BitBay listed Coinfirm’s AMLT token. Now AMLT owners can trade AMLT to Polish Zloty and Bitcoin on the largest European fiat-crypto exchange platform. Trade on Bitbay here. With the goal of bringing better transparency and security to cryptocurrency, Coinfirm has created a global system based on two solutions: The Coinfirm AML Platform and the AMLT Network with its AMLT token. For providing valid data on Cryptocurrency addresses to the Network, Members of the AMLT Network receive a Data Reward paid in AMLT each month. AMLT tokens are not only the reward for Network Members but a preferred choice of payment for Coinfirm products and solutions used by major Crypto entities like Dash, over 100 ICOs, banks and financial institutions around the world.The number of data submissions and Network Member applications will increase even more as BitBay has listed ALMT and joined the Network. Token owners can trade and exchange AMLT for Polish Zloty and Bitcoin. At 6pm on November, 22nd (CET) BitBay and Coinfirm will have a Live YouTube Video Conference about AMLT and BitBay collaboration and more in the BitBay YouTubechannel. Grant Blaisdell (Co-Founder at Coinfirm) will talk about the projects and answer viewers' questions. Here you can subscribe to the YouTube Live Conference on AMLT. Shortly after announcing the cooperation between both companies, BitBay listed Coinfirm’s AMLT token. Now AMLT owners can trade AMLT to Polish Zloty and Bitcoin on the largest European fiat-crypto exchange platform. 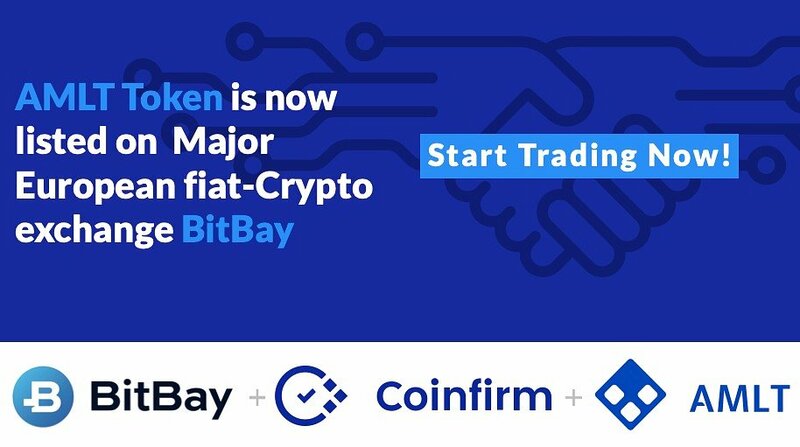 Trade on Bitbay here.With the goal of bringing better transparency and security to cryptocurrency, Coinfirm has created a global system based on two solutions: The Coinfirm AML Platform and the AMLT Network with its AMLT token. For providing valid data on Cryptocurrency addresses to the Network, Members of the AMLT Network receive a Data Reward paid in AMLT each month.There’s never been a solution like AMLT in either the traditional or Blockchain economy and without it market participants have had no voice to report entities tied to ransomware or other types of fraud for example. With hundreds of cryptocurrency addresses already reported to the Network in the 1st month of beta, a reward of 100K AMLT tokens has already been distributed to Network Members after validation of data provided through the AMLT Network Member Panel and APIGrant Blaisdell, Co-Founder at CoinfirmAMLT perspectivesAMLT tokens are not only the reward for Network Members but a preferred choice of payment for Coinfirm products and solutions used by major Crypto entities like Dash, over 100 ICOs, banks and financial institutions around the world.The number of data submissions and Network Member applications will increase even more as BitBay has listed ALMT and joined the Network. Token owners can trade and exchange AMLT for Polish Zloty and Bitcoin.AMLT token is a promising project, and we are happy to have it on board. For now, we decided to open AMLT/PLN and AMLT/BTC markets, however, with our internal Fiat Exchange service, you can easily exchange PLN into EUR and send a wire bank transfer to your account. In the case of considerable interest in AMLT, we do not exclude opening new marketsPatryk Kadlec, VP, Chief of Business Development at BitBayYouTube Live Conference on AMLTAt 6pm on November, 22nd (CET) BitBay and Coinfirm will have a Live YouTube Video Conference about AMLT and BitBay collaboration and more in the BitBay YouTubechannel. Coinfirm serves as a foundation for the safe adoption and use of blockchain. The Coinfirm AML/CTF Platform uses proprietary algorithms and big data analysis to provide structured, actionable data that increases efficiency, reduces costs and streamlines compliance to near automation. A recognized leader in their field and among the most influential blockchain and regtech companies, the blockchain agnostic platform benefits not only companies operating around blockchain but also major financial institutions, asset management, and BI companies. In addition, Coinfirm develops dedicated blockchain solutions such as their data provenance platform Trudatum, currently being piloted for adoption by multiple financial institutions. BitBay is the third largest cryptocurrency exchange in Europe. The platform was founded in 2014 in Poland. Its market share in the home country is around 70%. From the very beginning, BitBay has focused on international expansion. Today it has nearly 1 million users worldwide and employs more than 100 people. The exchange lists over 20 cryptocurrencies and allows for fiat deposits and withdrawals in USD, Euro, and Polish Zloty. Following the rapidly growing cryptocurrency community, BitBay is developing and expanding its offer with unique and original products such as an internal fiat exchange, the PRO mode for advanced traders, crypto payment gateway BitBayPay, and professional ICO services. In 2018, BitBay was awarded the title of The Best Cryptocurrency Exchange during Cryptocurrency World Expo - Berlin Summit.